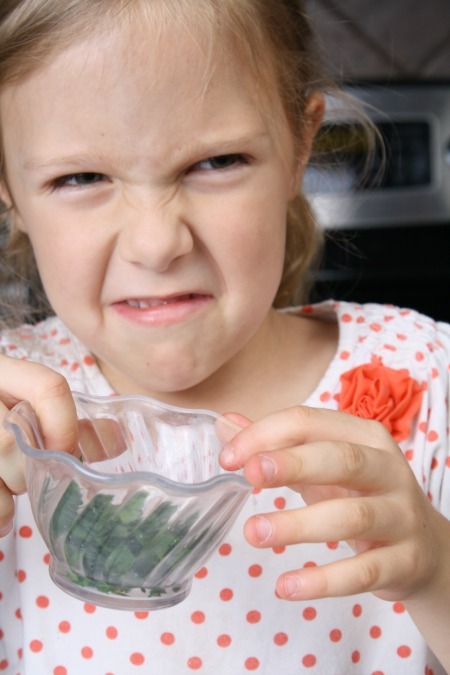 This week’s theme for Discover & Explore is Cooking with Kids. 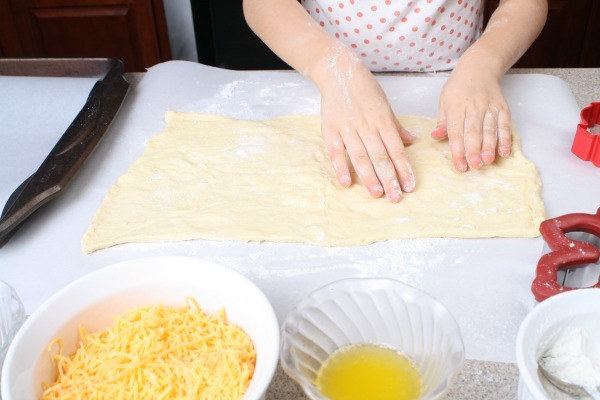 When I originally started blogging I planned to share much more often about ideas and recipes for cooking with kids. Lovey and Tinker both enjoy helping in the kitchen, and very few meals in this house are made without their help. 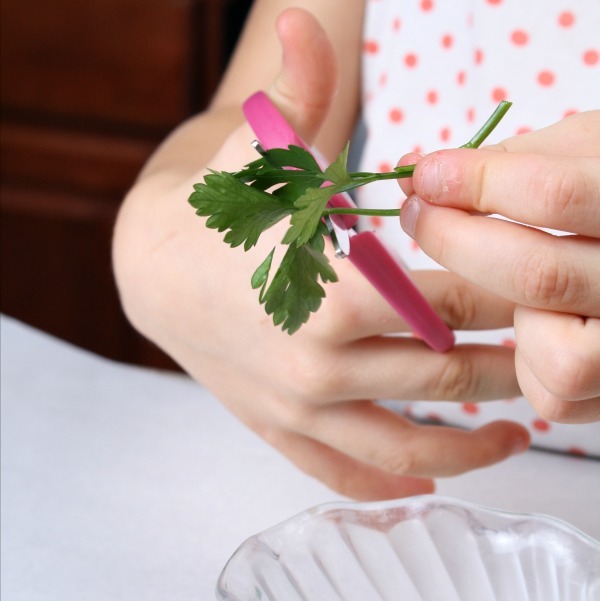 Somehow I haven’t shared much this past year, so I’m excited to share one simple recipe we found that works very well for cooking with kids. 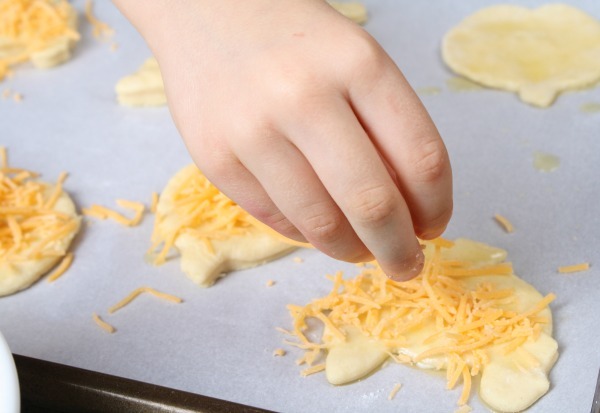 The original inspiration for this recipe are the cheesy crescent roll leaves created by Hungry Happenings. Visit the site for the full recipe tutorial for adults and tips for reheating these rolls for Thanksgiving dinner. 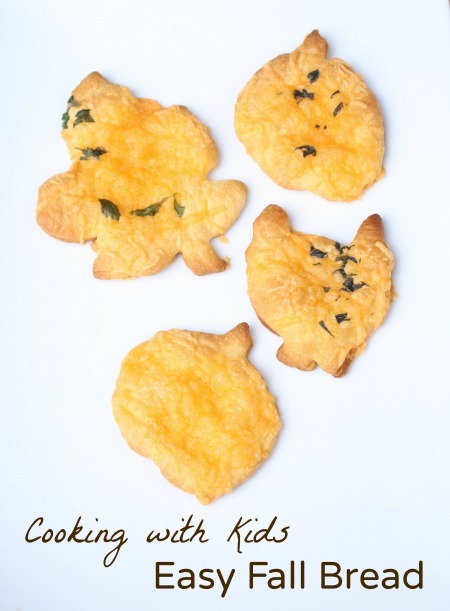 I’ll be focusing on the parts of the recipe we did to make this a super kid-friendly cooking with kids recipe. Lovey was able to do almost everything for this recipe on her own with my supervision. Lovey, age 4, wanted to bake bread, so these directions were planned with a preschooler in mind. I decided to use fresh herbs instead of dried ones so that we could discuss the textures and scents of the herbs. 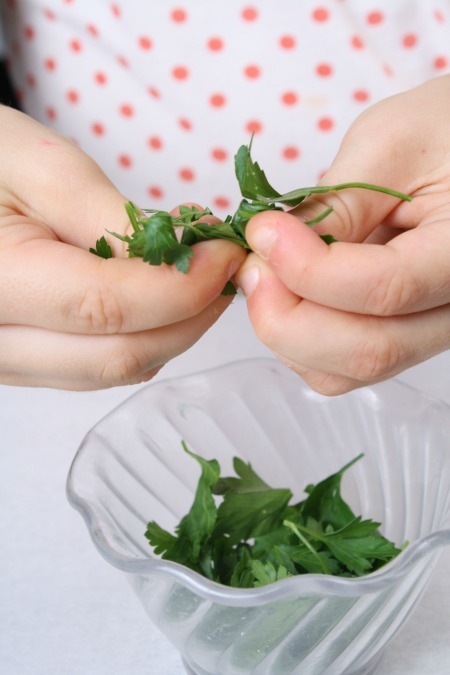 I chose leafy parsley and oregano, but you could select any herbs you like or even use dried ones to save time. We kept two separate bowls of each herb. Lovey did her best to trim the leaves into tiny bits. We probably didn’t follow proper procedures for preparing herbs, but the finished bread tasted great anyway. After snipping some of the leaves off, Lovey did a little pinching and tearing to break up the herbs even more. The cutting, pinching, and tearing were great for working those fine motor muscles. 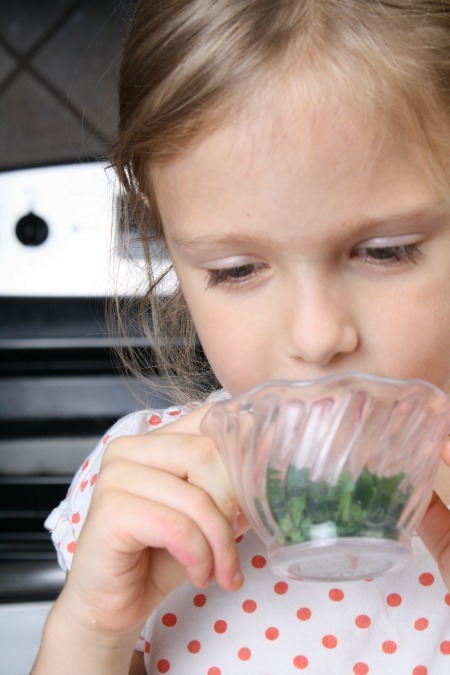 We took a moment to explore our sense of smell and see what we thought of the herbs. Lovey was not too pleased with the smell! Next I helped her line a baking sheet with parchment paper and lightly dust our work space with flour. 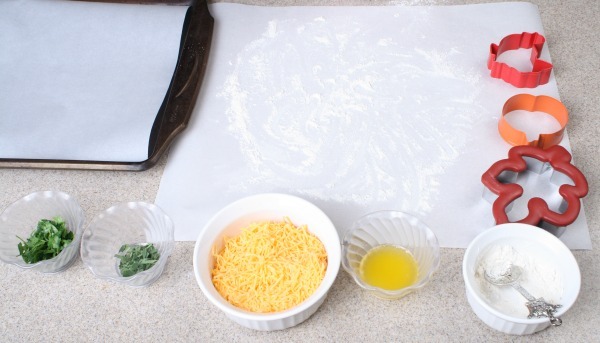 We set the herbs, shredded cheese, melted butter, and cookie cutters out so they were easy to grab. I rolled out the crescent rolls and Lovey did her best to pinch the seams together. This was another way we incorporated fine motor practice. 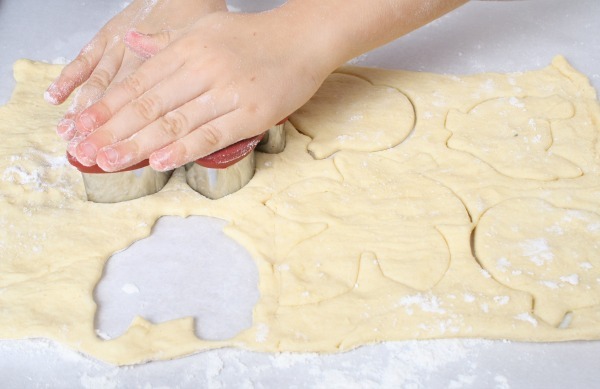 Next Lovey used the cookie cutters to cut the dough. We used the Wilton Maple Leaf Cutter and pieces from the Wilton Harvest Cookie Cutter Set. 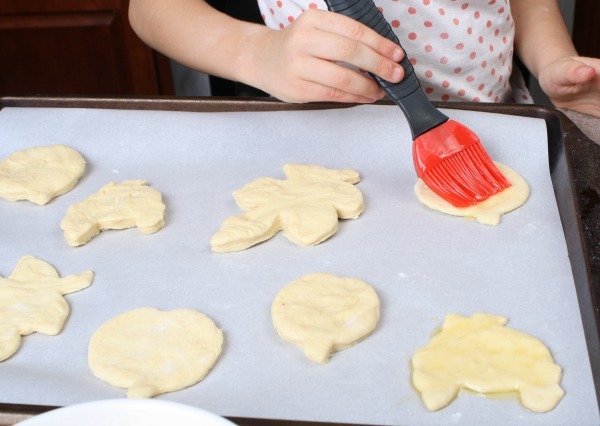 Once we placed the fall shapes onto the baking sheet Lovey gently covered them with the melted butter. Then she chose which herbs to put on which pieces of dough. She decided we might want to leave some plain in case the herbs tasted as bad as they smelled. Ha! After baking at 400 degrees for about 8 minutes, we had this beautiful fall bread to enjoy with dinner. The linky will remain open for one week. On Fridays all co-hosts will feature activities in a separate post and share featured posts on the Discover and Explore Pinterest Board. Don’t forget to visit the other co-hosts to see what they are sharing for this week’s theme. Your daughter’s face is seriously too cute!! This would be a fun activity to do with my son when he’s a bit older, and the bread looks scrumptious! Thank you so much! She’s has my knack for making faces for sure. The bread did turn out very yummy. I hope you and your son make it together when he’s old enough. Thanks for sharing a link to my Crescent Rolls Leaves. Your batch turned out great, and it was so fun seeing Lovely create these pretty leaves. Her face while smelling the herbs is priceless! Thank you so much for the inspiration, Beth! I loved the story of your inspiration for the recipe. This looks yummy- lthough I think my favorite photo is of Lovey’s reaction to the herbs, LOL! 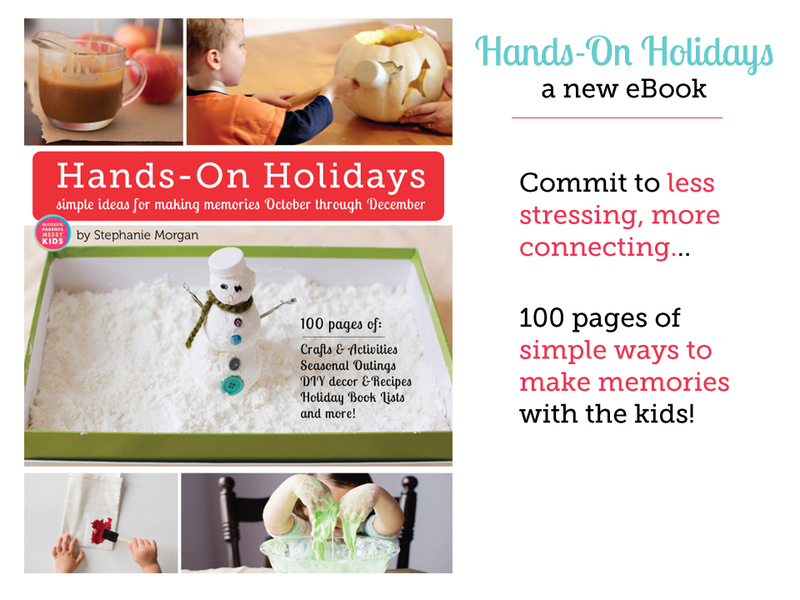 And the Hands-On Holiday book looks wonderful! I love the photo, too! And wouldn’t you know she actually liked the bread with the herbs in the end? We made Cinnamon Tortilla Crisp in the shape of pumpkins. It was very easy and a yummy snack. I found the recipe on East Coat Mommy’s blog. We love making those! 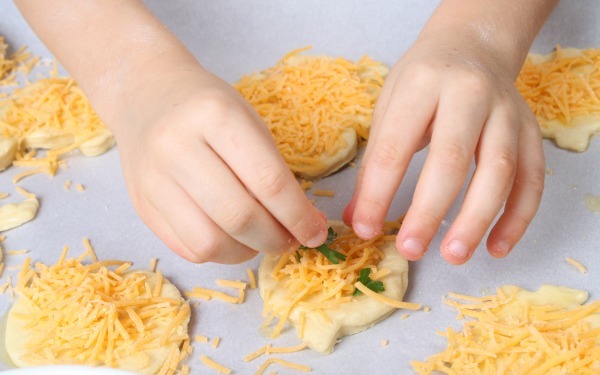 You’re right…such an easy and tasty recipe for cooking with kids. These would make a yummy snack!